Moxa (made of a herb called Mugwort) is a Traditional Chinese Therapy using either moxa stick or corn to treat all kinds of symptom. Moxa has been used in China for thousands of years. The purpose of moxa is to heat the acupuncture points and get the herbal ingredient into your body, strength the blood circulation, and stimulate the flow of “Qi” (energy). Moxa is very good for pain, low energy, deficiency, digestive problem, PMS, period cramping, infertility, cold, toxin and more. What is Warm Needle Technique? 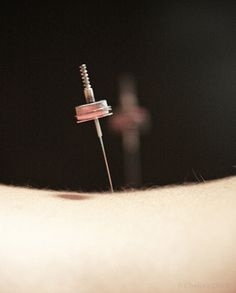 Warm Needle Technique is a Traditional Chinese Medicine therapy. By putting high quality moxa corns on top of needle, heat and mugwort ingredient can penetrate down along with the needle and get into the body. Why is Yi’s Warm needle technique unique and good for Washington state? Yi alway provides moxa treatment for her clients, and the clients really like it. It is very therapeutic since the humidity in Washington state gets accumulated easily into human bodies and transfer into different form of toxin which people can’t get rid of. Yi put the moxa corn on top of the needles to provide extra stimulation to acupuncture points, and she also puts fresh ginger slices on top of acupuncture points to get the ginger ingredient into body, and to promote the flow of “Qi” (Energy). No, the moxa doesn’t hurt at all. You will feel the heat, the “Qi” (energy), and blood flow in your meridians. t is very good to take the toxin out of the body, it also can be used on the face for lifting and smoothing purpose. What is scraping good for? needle and moxa, people get instant relief. How long will the scraping marks stay? Normally 3-4 days. Facial scraping will be very gentle and will not leave any marks. How often does scraping needed? It depends on symptoms, some people need more frequent and some people need it less frequent.